Advertisement has many options, you can go about print media or electronic media, both will generate a good amount of traffic, but the real job is to advertise your stance in an attractive way so it may get approved. Clients ask for the changes, amendments, rectification and sometimes the remake of the design piece because nothing satisfies them of course when they are shedding their dollars upon advertisement they want the superfluous results as well. Therefore the designers have to be really upfront about the latest trends and techniques to make a design piece that may look attractive and get approved without any criticism. However you can always ask what your client wants, how he wants the design to be, how he likes his advertisement to look and this will sort out many issues between the designer and the client. Outdoor advertisements on the busses, trucks, billboards, flyers and on emblems help people to stare at them and get the gist out of them. Usually billboard advertisement is highly recommended and preferred over any other advertisement option because it is more direct, clear cut, captivating and pedestrians can easily get caught up buy that. Remember a big billboard is always stared at, people slow down the speed of the vehicles to actually notice what has been written or advertised on it. 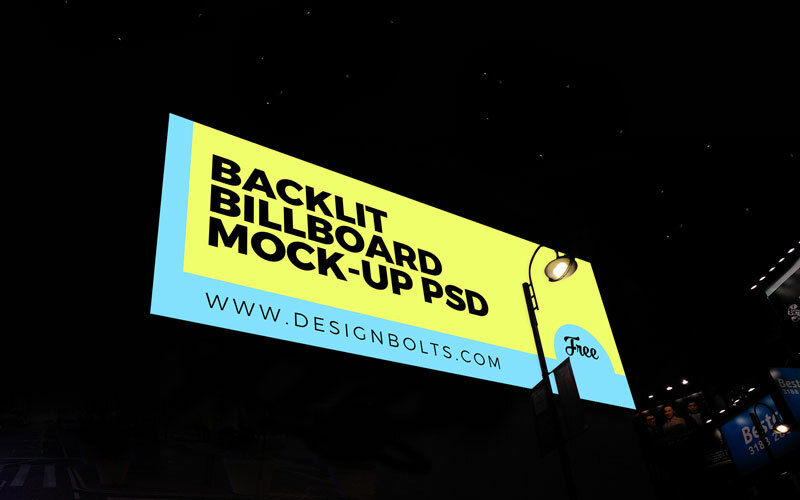 Down here I am presenting before you free night-view backlit billboard mockup. Insert in your own designed advertisement and show it off to the client to give him all idea about the advertisement, its colors, font and overall feel. Check this out right away, do let us know what do you think about this and we will catch up with you again tomorrow and the days ahead for more exiting and informative design feed. Here we go!